The temperature of a friction pair exerts considerable influence on the tribological behavior of a system. 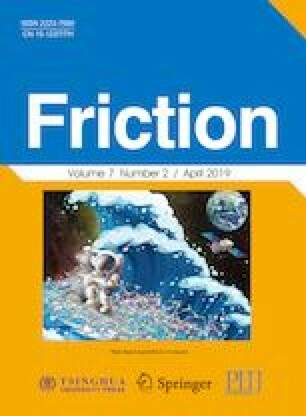 In two cases, one with and the other without Cu (copper) nanoparticles, the temperature increase in friction pairs caused by frictional heating and its tribological properties at various temperatures are studied by using the molecular dynamics approach. The results show that temperature distribution and surface abrasion are significantly improved by the presence of Cu nanoparticles. This is one of the reasons for the improvements in tribological properties achieved in the presence of nanoparticles. The temperature and range of influence of frictional heating for the model without nanoparticles are significantly increased with the increase in the sliding velocity; however, in the model with nanoparticles, the temperature gradient is confined to the area near the Cu film. With an increase in the temperature of the friction pair, the improvement in anti-wear properties associated with the presence of Cu nanoparticles becomes more significant. Chengzhi HU. He is an assistant professor in Laboratory of Ocean Energy Utilization of Ministry of Education at Dalian University of Technology. He received his Ph.D degree in engineering thermophysics from Dalian University of Technology, China, in 2016. His research involves the friction properties of micro-nanostructure surface and nano-lubricants. Jizu LV. His current position is an associate professor in Laboratory of Ocean Energy Utilization of Ministry of Education at Dalian University of Technology. He received his Ph.D degree in power engineering and engineering thermophysics from Dalian University of Technology, China, in 2009. His research involves the heat transfer enhancement of nanofluids inside the piston cooling gallery of internal combustion engines. Minli BAI. Her current position is a professor in Laboratory of Ocean Energy Utilization of Ministry of Education at Dalian University of Technology. She received her Ph.D degree in power engineering and engineering thermophysics from Dalian University of Technology, China, in 1996. Her research involves the coupled mechanism of heat transfer, lubrication and friction for piston set-liner of internal combustion engine. Xiaoliang ZHANG. He has been an associate professor in School of Energy and Power Engineering at Dalian University of Technology, China since 2016. He received his Ph.D degree in engineering thermophysics from Chinese Academy of Sciences in 2013. He was a joint Ph.D student in Laboratory of Thermodynamics in Emerging Technologies at ETH Zurich between 2010 and 2011. He was a research engineer in Department of Chemical and Biomolecular Engineering at National University of Singapore between 2012 and 2013. After Ph.D graduation, he worked as a postdoctoral researcher at RWTH Aachen University between 2013 and 2016. His research is mainly focused on molecular dynamics simulations and first-principles calculations of nanoscale thermal transport. This work is supported by National Natural Science Foundation of China (Grant No. 51806028, 51876027, 51476019, and 51376002) and the Fundamental Research Funds for the Central Universities (DUT17RC(3)043 and DUT 17JC23). Open Access This article is licensed under a Creative Commons Attribution 4.0 International License, which permits use, sharing, adaptation, distribution and reproduction in any medium or format, as long as you give appropriate credit to the original author(s) and the source, provide a link to the Creative Commons licence, and indicate if changes were made. The images or other third party material in this article are included in the article′s Creative Commons licence, unless indicated otherwise in a credit line to the material. If material is not included in the article′s Creative Commons licence and your intended use is not permitted by statutory regulation or exceeds the permitted use, you will need to obtain permission directly from the copyright holder. To view a copy of this licence, visit http://creativecommons.org/licenses/by/4.0/.